Money, money money! It's crunch time ladies! According to CCSS, 2nd graders are expected to master time and money. So that means we will be eating, sleeping, and speaking time and money for the next several weeks. We're still finishing up a chapter on 3-digit addition and subtraction, but since my kids just FLY through those lessons, I thought I'd use the extra time to get money rolling. These activities are great for time-fillers but would also be perfect for math centers. 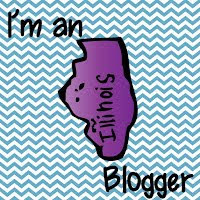 I have the worksheets in plastic sheet protectors (trying to save a few trees!) but you could just ask easily laminate the pages and dry erase works just as well. Here the student has a mesh baggie with nine coins: 3 dimes, 3 nickels, and 3 pennies. She pulls three random coins out of the bag, records each coin from largest to smallest. Then she counts the coins and writes the total amount on the line. Easy-peasy! Later, I can just toss in 3 quarters and the activity goes to a whole new level! 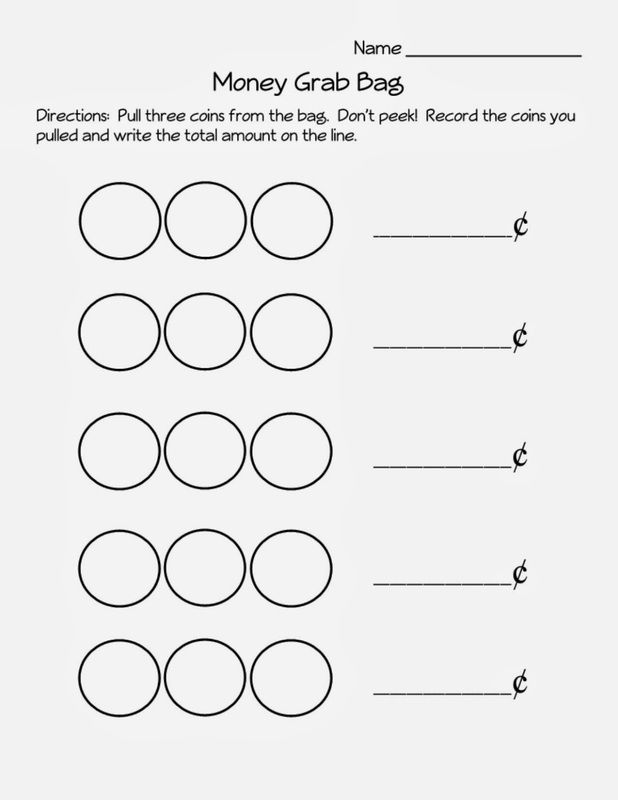 For this activity, you need a worksheet and a set of coins: 3 dimes, 3 nickels, and 3 pennies. 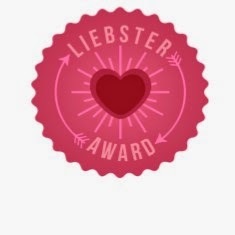 Click on the image to get this freebie. Here the students are working with just nickels. Most of our coins are divisible by five. That means we can skip count by fives to count money. 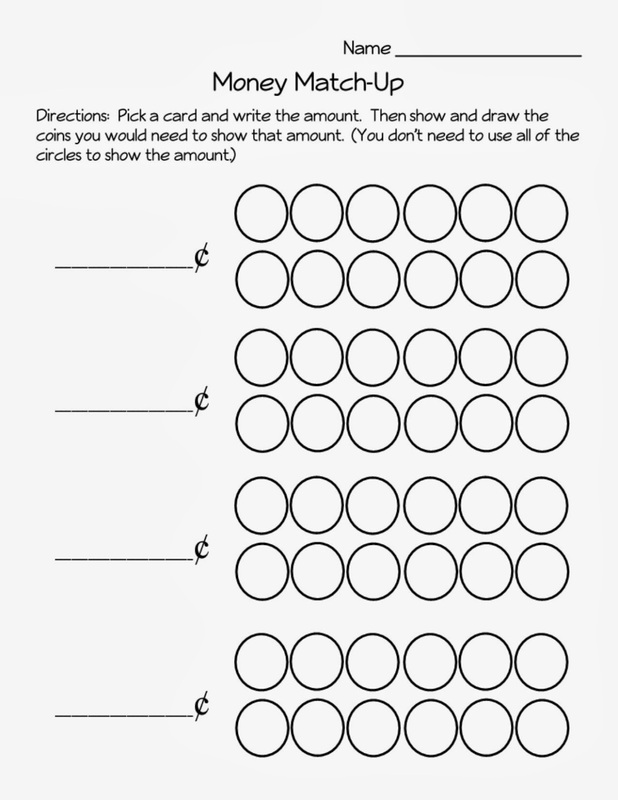 This activity makes the students think of 25 cents as 5 nickels, or 10 cents as 2 nickels. To play, the student rolls a money die, writes the amount on the line. Then counts out enough nickels to show that amount and write how many nickels it took. Since the 1 cent doesn't work so well, I made those the "Strikes". If they roll a 1 cent, they get a strike, three strikes, you're out! These money dice were hand-me-downs so I'm not sure where they came from. The six sides have 1 cent, 5 cent, 10 cent, 25 cent, 50 cent, and $. If you can't get your hands on a set of dice like this, you can easily make them or have the students draw cards out of a bag. 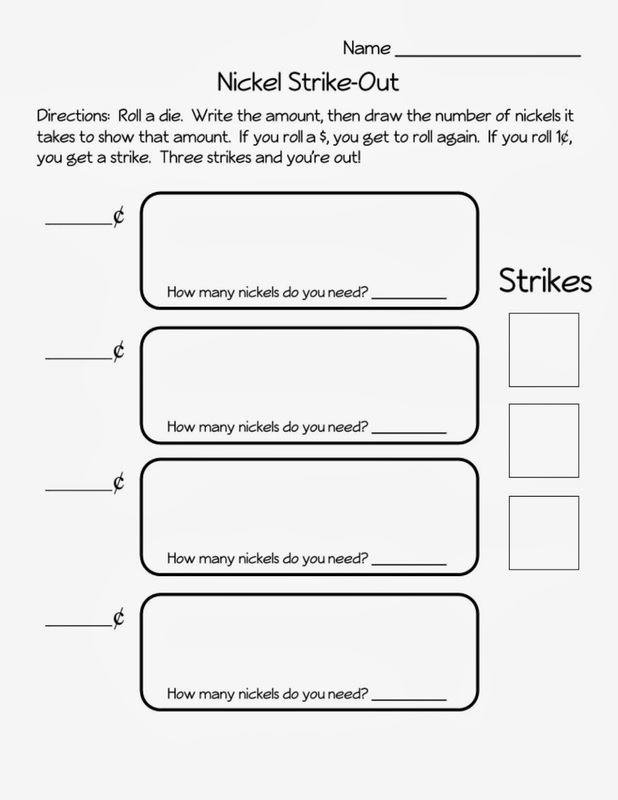 For this activity, you need the worksheet, several nickels, and one money dice. Here the group is taking a given money amount and showing it using dimes, nickels and pennies. The student just draws a money card from the stack, writes it on the line and then uses coins from the mesh bag to show that amount. Right now, the card only go up to 30 cents. As we get further into money, I'll toss in the higher card amounts. For this activity, you need the worksheet, a set of coins, and the money cards. The money cards were leftover from an old calendar set. I couldn't bring myself to toss these. You can very easily make your own set for this. Not only does this get the kiddos working with money, it also reinforces place value. The student rolls a dice and counts that many pennies out onto their ten frame. With each turn they should fill up the frame. Once it's full, they trade the ten pennies for a dime. The first student to earn 5 dimes wins! For this activity, you will need a ten frame, a dice, several dimes and pennies. BTW..... the mesh bags that I keep (most) of my small manipulatives in came from Boxcars and One-Eyed Jacks. 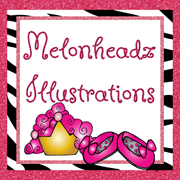 They are perfect for small things like coins and dice. The baggies also make disinfection super-simple. Just toss your bags (manipulatives and all!) into the wash with a touch of detergent and bleach and the germs wave bye-bye! The sheet protectors came from C-Line. You can get a set of 10 for $23. I know, that sounds high but these babies can sure take a beating! Click on the picture to take you to the C-Line site. Enjoy the latest weather, friends!